DSP and this print stood out for the sketch sides. I then pulled Soft Sky, Lemon Lime Twist and Garden Green ink pads. I thought, why not blue flowers with lime lemon centers! I cut the Very Vanilla at 4" x 4 1/4". I cut the strips of DSP at 3/4" x 4 1/4". like I did on my pink flowers earlier this week. leaves stamped off once in Garden Green to keep the soft feel. I started to add more gold something but stopped myself. I liked it it just like this! 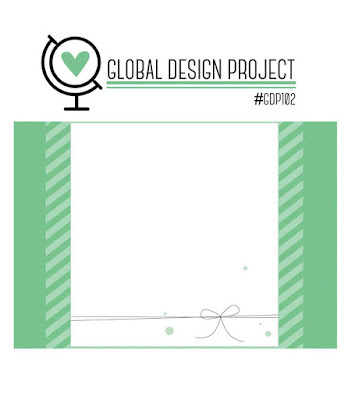 over at global-design-project.com this week! the Night of Bethlehem bundle. 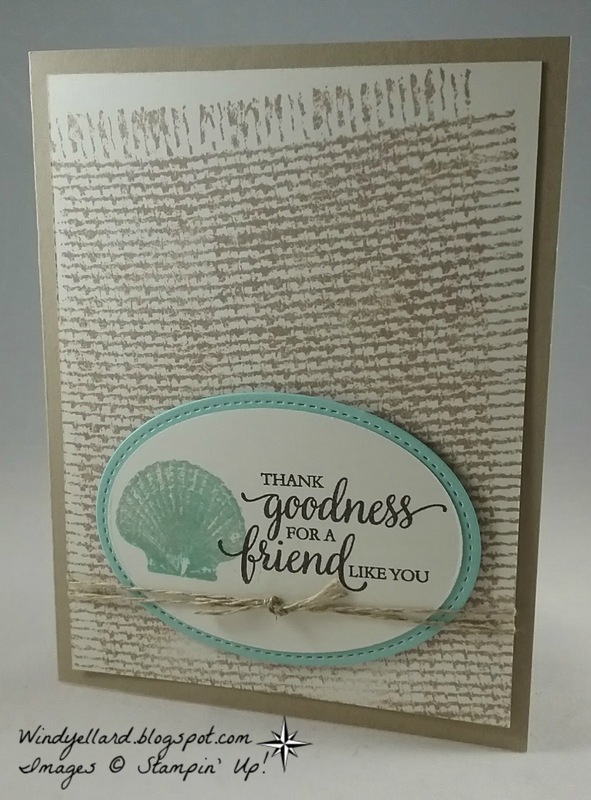 I stamped one of the sentiments in this set in Night of Navy. scape and stars the same color. Night of Navy card base. It was a quick card that could be mass produced in a short time, too! Today is my friend Jen's birthday! I knew I had to make my version for Jen. twice with each of the two stamps. I added the Smoky Slate as the center but the dots are in Basic Gray. 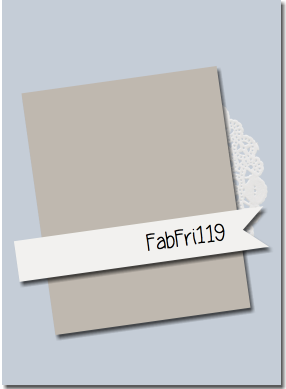 Basic Gray card stock I embossed with the Petal Burst emboss folder. I stamped the Happy Birthday in Basic Gray from the Beautiful Bouquet stamp set. I finished it off with a Smoky Slate gingham bow! Not to fancy but with these colors, I hope she loves it! 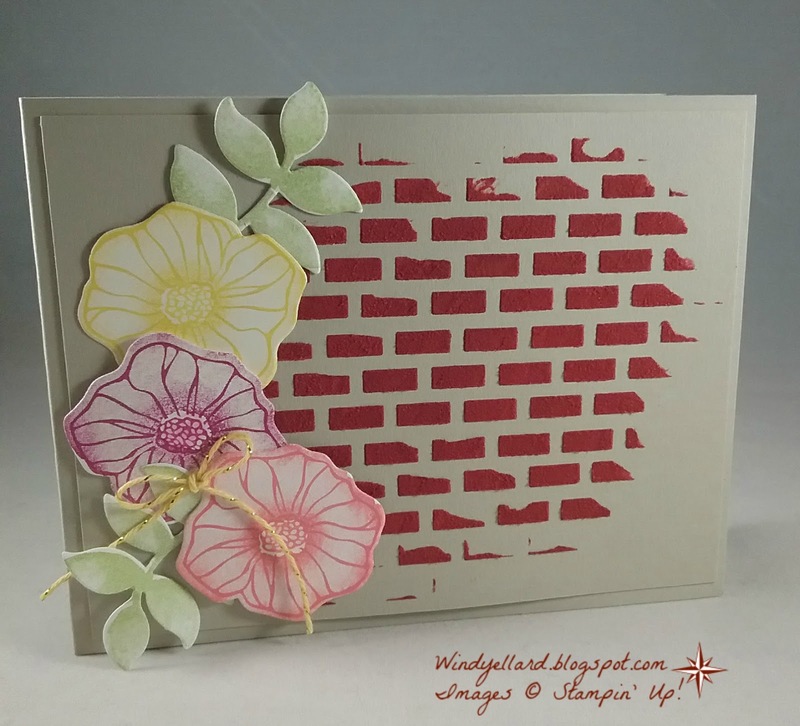 I designed this card the same time as the brick wall one yesterday. 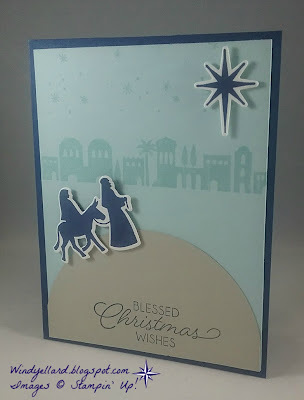 I wanted to do several projects while had the embossing paste out. white paste with Always Artichoke ink. on Crumb Cake card stock. Stitched Shape circle for the cup. ink to make it look lighter. along with the sentiment. I cut the cup and lid out with the matching Coffee Cups dies. gold thread and layered it behind the cup giving a little bling. Hope you have an exciting day full of blessings! in the annual catalog. It goes on wet and when dries, it feels like felt. But first I watched a video by Patty Bennett on how to use it. I cased her card here changing some colors. 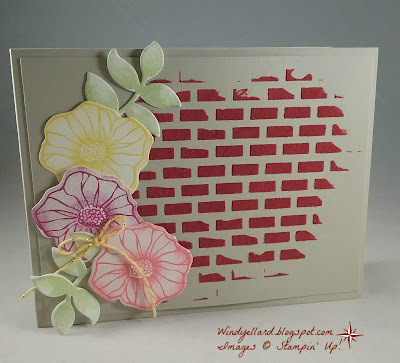 Very cool stencils like this brick wall make it easy so hope you can try it! This brick kinda looks like a heart but I was not trying to do so. and mixed with a plastic tool. 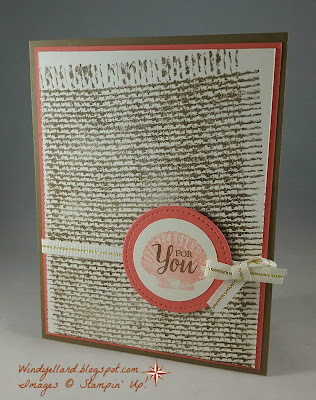 I then spread it over a piece of Sahara Sand card stock. with the Oh So Eclectic set and cut them with the matching dies. I added a piece of twine that retired from this past spring. Layered it all on another piece of Sahara Sand for the base. It was really a quick card. with the daisy set and punch. Well, this challenge changed those things. 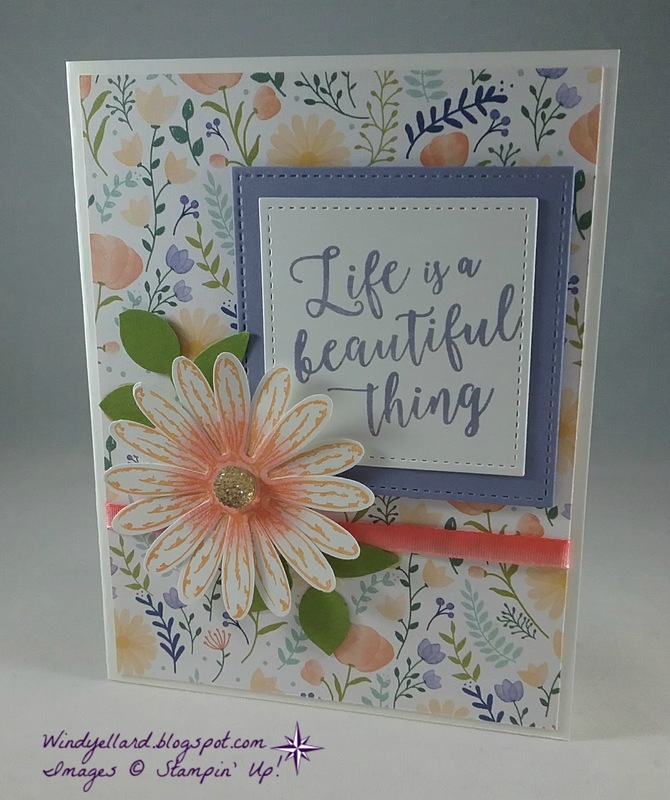 I am playing the bottom row with die cut, sentiment and floral. I die cut the squares from the Stitched Shapes framelits dies. 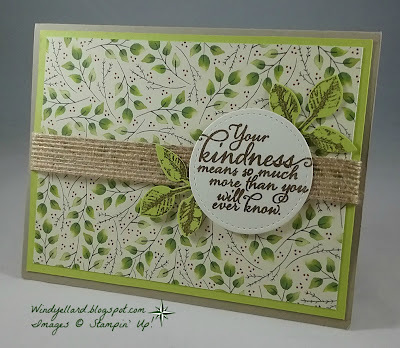 I stamped my sentiment in Wisteria Wonder from Colorful Seasons stamp set. I then took a sponge dauber and added Calypso Coral to the center. For bling, I added the gold faceted gem. 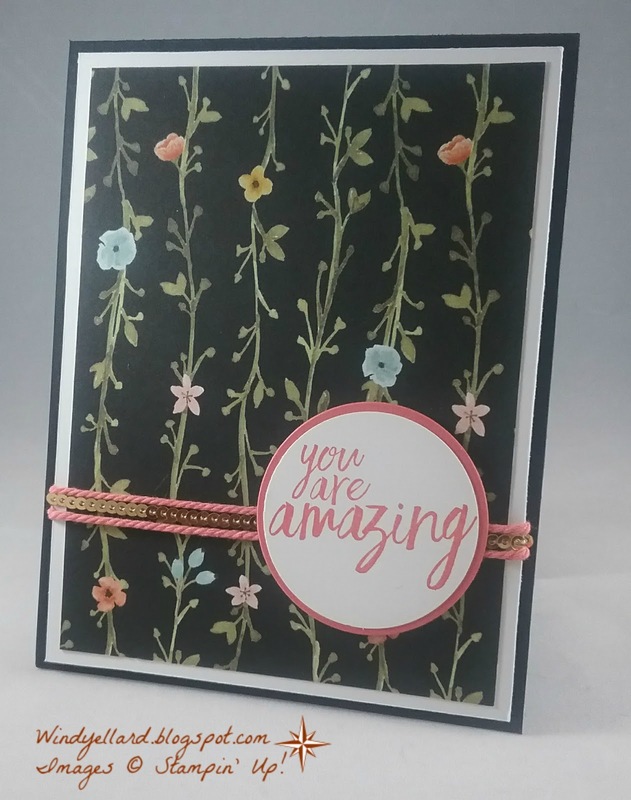 Love the DSP called Delightful Daisy and this pattern/print is beautiful! I finished it off with some Calypso Coral 1/4" ombre ribbon. I hope you have a lovely weeknd! Head over to tictactoechallenge.com to play along this week! Playing again with my new bundle of pumpkins! The Pick A Pumpkin bundle is so fun to set, cut and arrange. it did not work with my last project. Was happy to start with it today. color to rock and roll my Pumpkin Pie textured pumpkin. 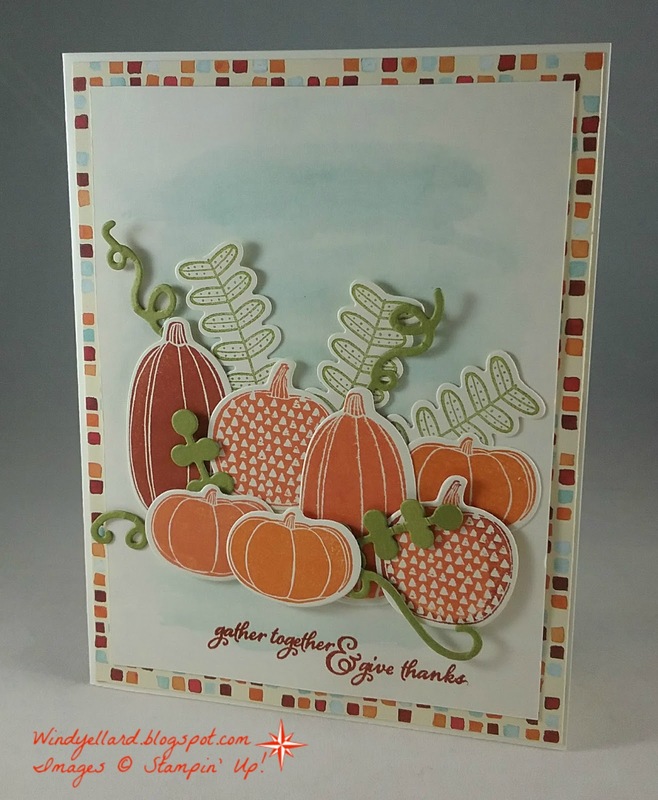 The little gourd in stamped in Peekaboo Peach ink. I cut several leaves and squiggles in Crushed Curry and Daffodil Delight. I then added some mini gold sequins and a linen thread bow. layered on a piece of Painted Autumn DSP with a thick Very Vanilla base. It just did not need a sentiment. Hope you can play along with the sketch challenge this week. grab my Fabulous Flamingo set! Glad I did! but what to do with the Night of Navy? I then thought about the birds from High Tide set which look good in a dark color. 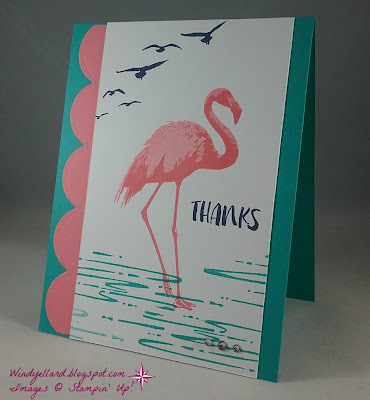 I stamped them up and added the thanks sentiment from the flamingo set. I did all this without thinking of a layout. 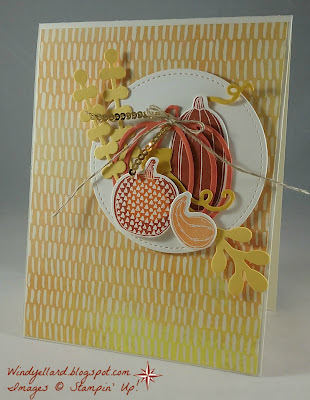 that used this scallop die from Seasonal Layers thinlits dies. I finished it off with a few rhinestones on the water. gold beachy tree and leave it gold without coloring it. 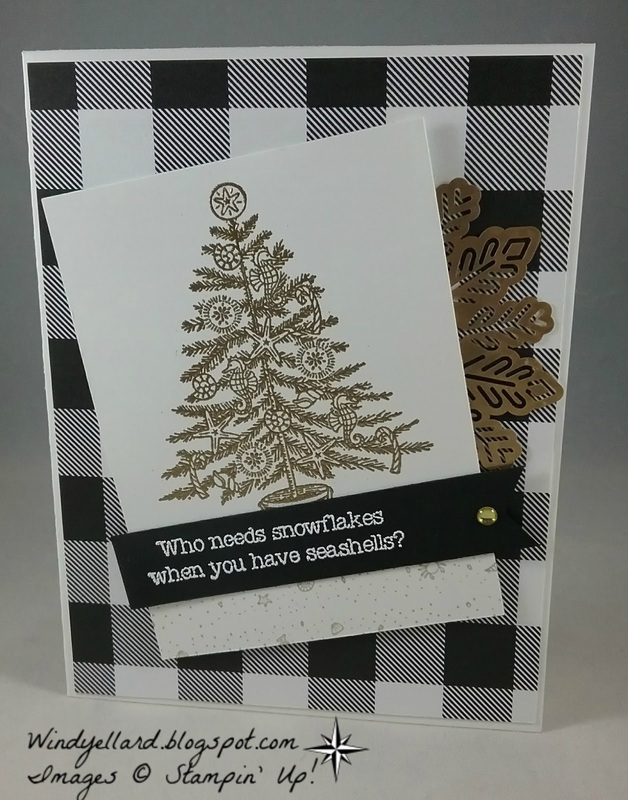 and then stamped the tree in VersaMark on Whisper White. 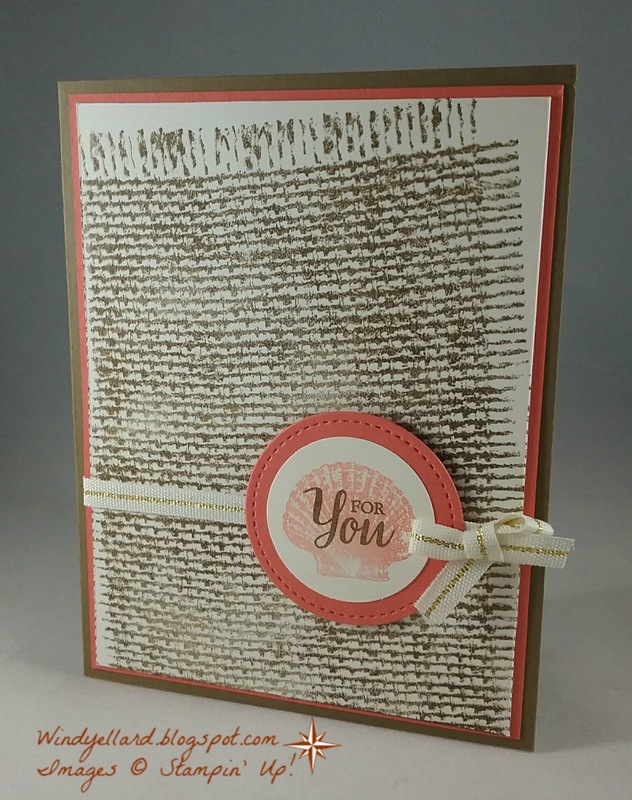 I heat embossed with gold emboss powder. in Winter White the sentiment. and layered it on a piece of think Whisper White for the base. on top. It needed a little gold too so I place a gold metallic shape on it. will all be in the new 2017 Holiday catalog which starts on Septmeber 1st! what to color in for the challenge. someone stamping it in gold or cooper and coloring in the ornaments. available to order on Sept. 1st! 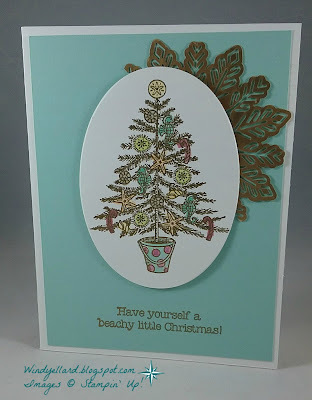 oval in VersaMark ink and then heat embossing in gold emboss powder. I used my aqua painter to color the shells, seahorses and such. in the new 2017 Holiday catalog. I was happy to play with the new bundle Pick A Pumpkin. with my large collection of pumpkins and gourds. painter to water color Soft Sky. leaves in Old Olive and cut them with the matching dies. I also cut some cute curls and leaves in Old Olive card stock. 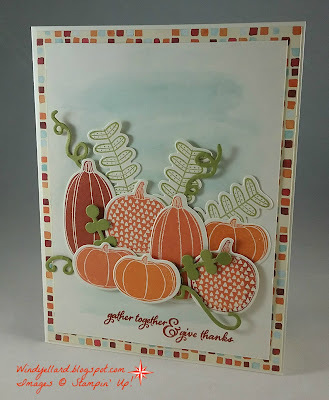 Painted Harvest stamped in Cajun Craze. I shall have more pumpkins for you soon! Calypso Coral stitched circle for another project, but then decided on another color. Calypso Coral card stock and then a Soft Suede base. 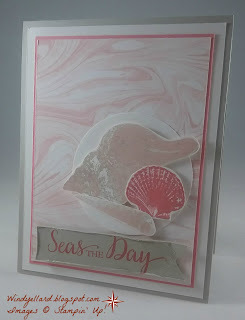 I I stamped the shell in Coral lightly by stamping off once with the ink. I then stamped the sentiment over it in Soft Suede and punched it with the 1 1/2"
I added some Natural trim in gold because I had a bow also laying unused on my desk. I decided to use the bottom row of leaf, free, splatter. combo of Fresh Fig, Crushed Curry and Tangerine Tango. You know I love purple! I cut the leaves from Seasonal Layers thinlits dies in these colors. 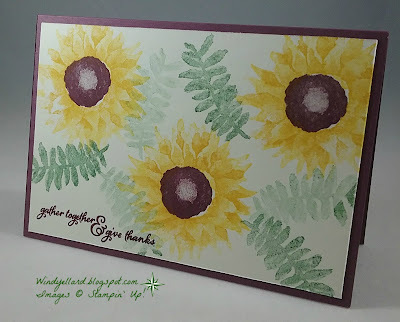 I used ink splatter also in these colors from Awesomely Artistic. Simple card but love the colors and leaves! Hope you can play along with Peggy's tic tac challenge this week! Head over to tictactoechallenge.com to play. I have not cut into the Whole Lot Of Lovely DSP. I have been hoarding it. I love this pattern with the flowering vine. from the All Things Thanks set. 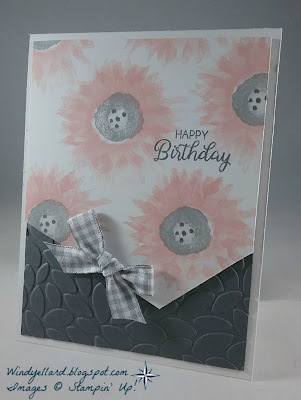 cut it out with the Layering Circles dies as well as a Calypso Coral. on the Basic Black base. Simple with a little sparkle. Thanks for stopping by and have a Fab Friday! 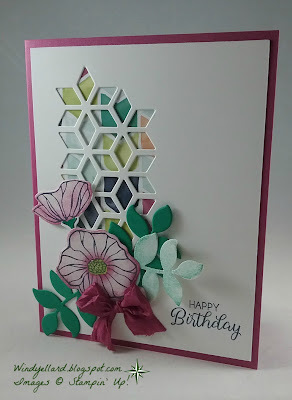 I love Brian's card and decided to case the layout and colors! 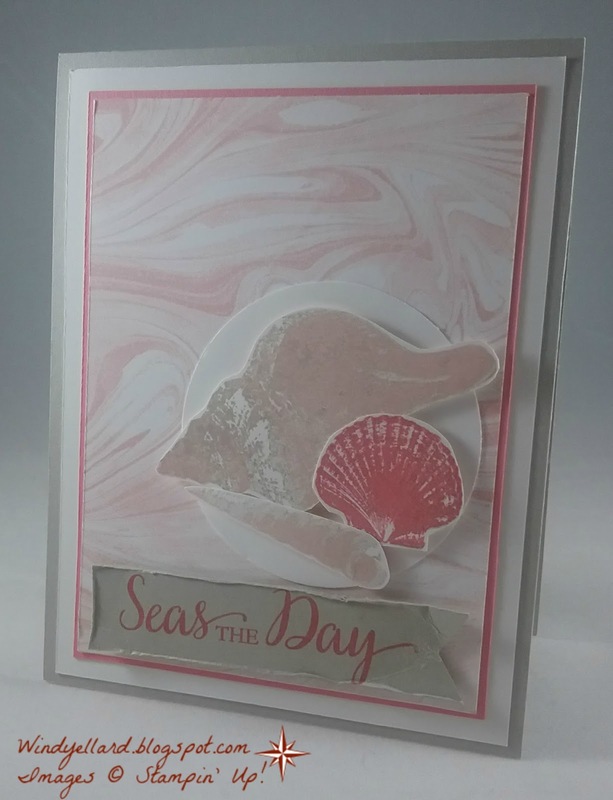 I started with the Marbled background stamped in Powder Pink ink. I layered it up but not as perfect as Brian does. and then Calypso Coral behind the Marbled piece. 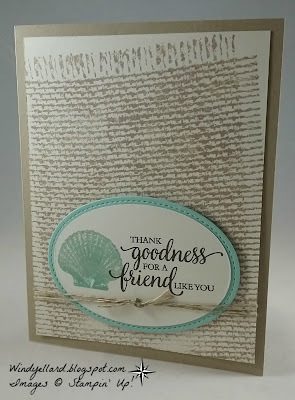 I then stamped several shells on Whisper White. The large shell and small one are in Sahara Sand and Powder Pink. I stamped the other shell just in Calypso Coral. I placed them on a Whisper White circle. Calypso Coral and then distressed the paper with my finger nail. The card turned out so soft! 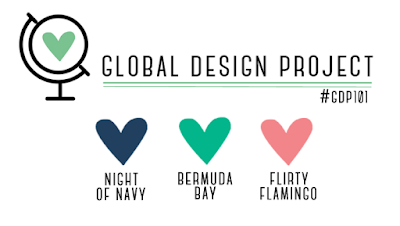 When I saw these colors, I was not sure what I was going to design. it would be different to stamp it in Bermuda Bay. I like how it turned out on Whisper White. Painted Harvest set on a white circle. 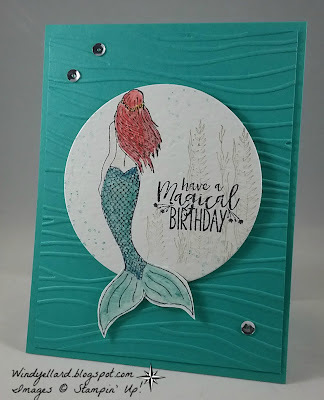 I stamped off with Calypso Coral and then full on with the second step stamp. I stamped the middle in Pear Pizzazz and the dots in Calypso Coral. and punched out with the matching leaf punch. 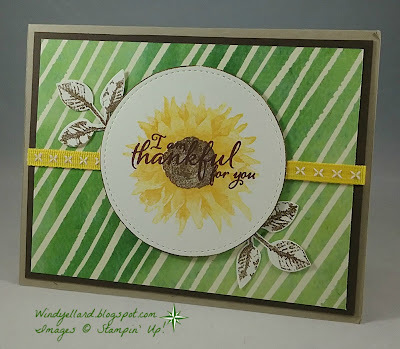 I also punched some leaves in Pear Pizzazz to add behind. Last of my Painted Harvest parade of cards! 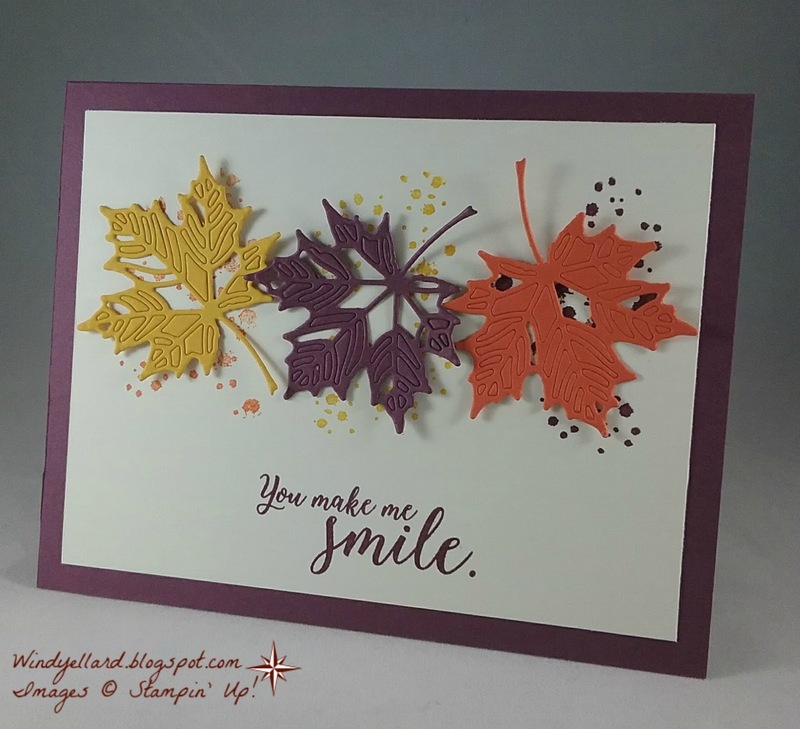 great pattern from the Painted Autumn DSP. I added some Tangerine Tango to the bottom. in Emerald Envy ink and cut out the leaves by hand. 1/4" Natural trim in gold. Hope you a sweet Tuesday! in Garden Green on Garden Green card stock. piece of Painted Autumn DSP also cut as a banner. stitched oval in Soft Suede. Simple card but oh I love those sunflowers! Fresh Fig to the middle! The leaves are in Garden Green...some are stamped off once. The sentiment was stamp in Fresh Fig to finish it off. The Very Vanilla background was then layered to a Fresh Fig card base. It was easy but makes a sweet card! Love this set and matching DSP. Again this is 6 days of painted Harvest suite! and Crushed Curry with Soft Suede in middle. I then stamped the sentiment in Fresh Fig. Daffodil Delight stitched ribbon across to finish it off. 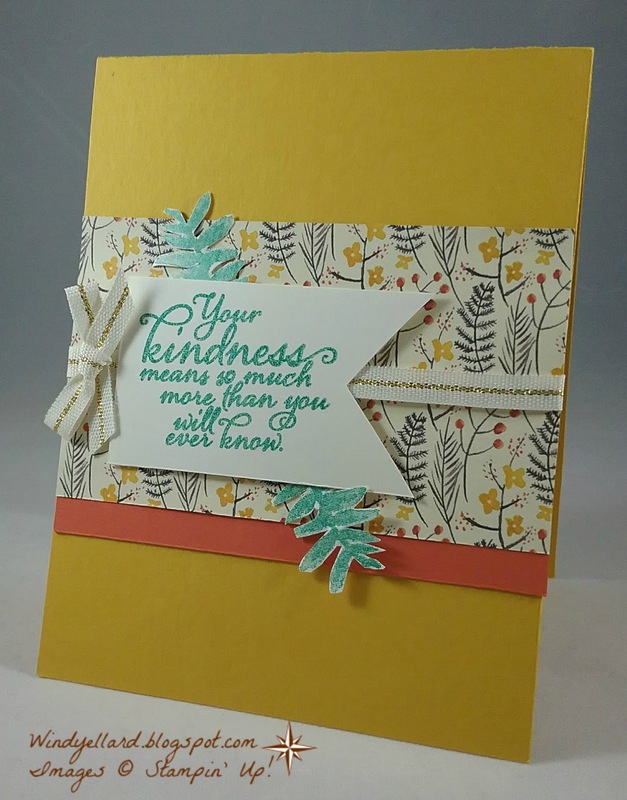 Your Kindness Means So Much! and Lemon Lime Twist card stocks I really like it now! with the Stitched Shapes circle. and punched with matching leaf punch. I added burlap ribbon across to finish it off. I love this set. It is new in the 2017 Holiday catalog beginning Sept. 1st. under an hour with a few supplies I had taken with me out of town. I made these bags for my guest in class to carry their cards home this month. 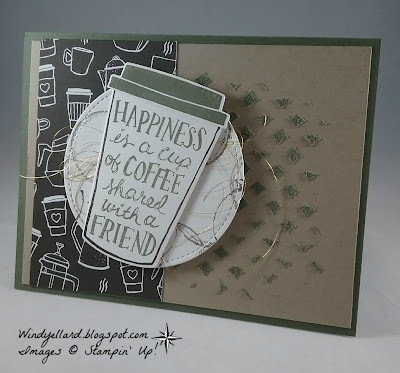 coffee cup , lid and the sentiment on Whisper White and cut them out with the matching dies. I also used those dies to cut the Soft Suede paper sleeve. 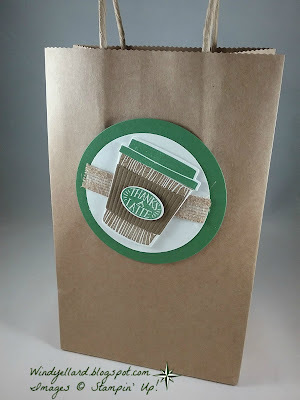 I layered some burlap ribbon behind for some more texture and natural look. up along with the Fabulous Flamingo set. card stock and the layered it on a thick Whisper White base. before popping up my flamingo image. 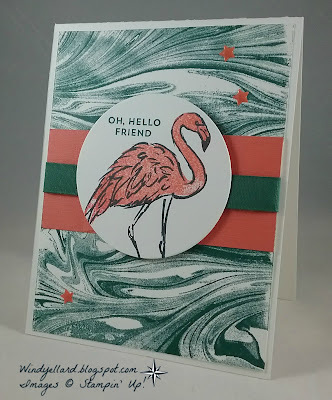 I stamp the flamingo in Calypso Coral and then Basic Black. 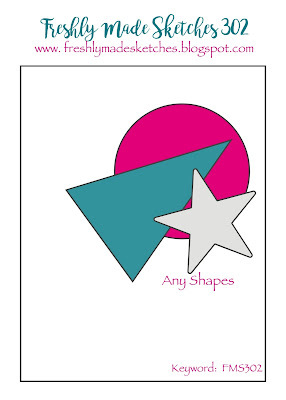 the Subtles enamel shapes (never seem to use the stars). Hope you have a Fab Tuesday! I decided to go with the center row down with sequins, distressed inks and stencil. I then sponged around the edges of the white card stock as well. for the base after wrapping some black twine around. from the Painter Harvest set which will be in the holiday catalog on September 1st, 2017. It fit just right inside the Pretty Label punch. I hope you can play along with the tictactoechallenge.com this week! Well, the last card for class this week is with the Oh So Eclectic set. Naturally Eclectic DSP behind the cut out. 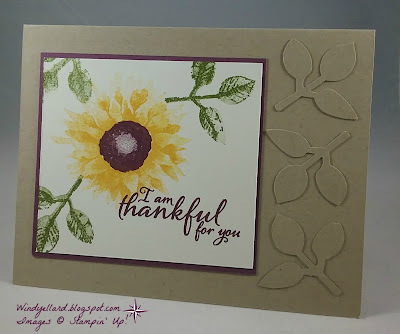 and cut them and a few more leaves from Emerald Envy card stock. 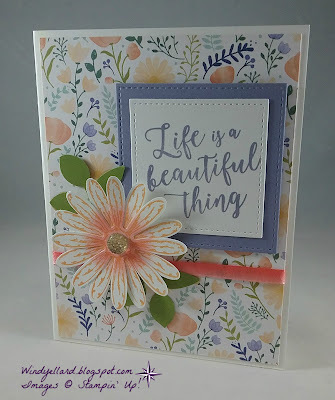 I stamped the flowers with first Berry Burst and then with Night of Navy. and the center of the bottom flower with a Lemon Lime Twist marker. off with a Berry Burst crinkled ribbon bow. I have designed this card as the fourth for card class next week. oval in Chocolate Chip and and the shell in Crumb Cake and Pool Party. I cut a stitched oval in Pool Party and layered on Burlap background. I finished it off with some linen thread across the card. This is my third card for classes next week! 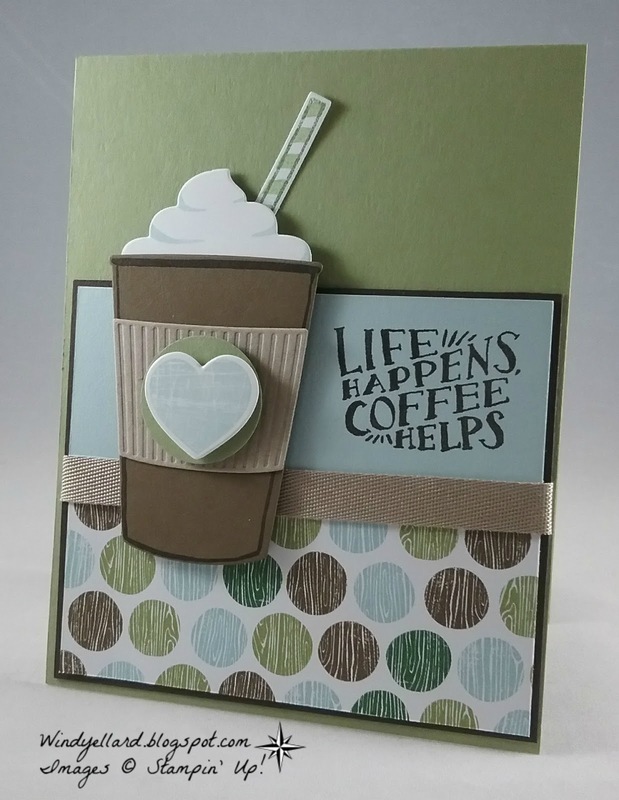 for the class card with the Coffee Cafe bundle. I finally decided it was summer and go cold. I stamped the cup with Early Espresso ink on Soft Suede card stock. Wood Words and cut it with a matching die from Wood Crate. I layered it on a Pear Pizzazz circle. pick a sentiment even Happy Birthday to put on their card. card stock and place on a Pear Pizzaazz card base. It is all finished off with some Crumb Cake ribbon across the card. I really like the colors and this suite! My second card for class next week! 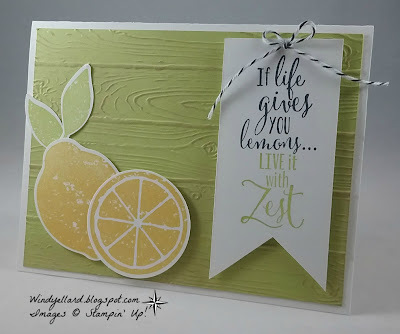 I did the same with the leaves and use the Lemon Lime Twist ink. I finished it off with a black and white twine bow. This is my first card for class next week! to have to fussy cut the mermaid. I stamp her on water color paper in Memento Tuxedo Black. then some background pieces from the set in Sahara Sand and Bermuda Bay. 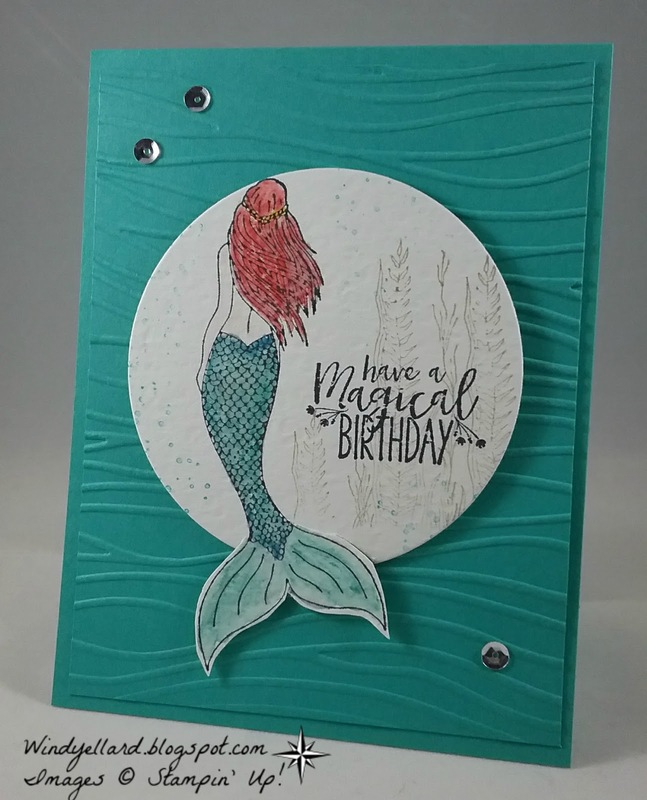 layered it on a Bermuda Bay card base. I then added some silver sequins for a little bling.